But in home décor, they’re a mainstay! For one thing, pleated draperies lend depth and texture to the room, while making a bold statement when paired with complementary fabrics. 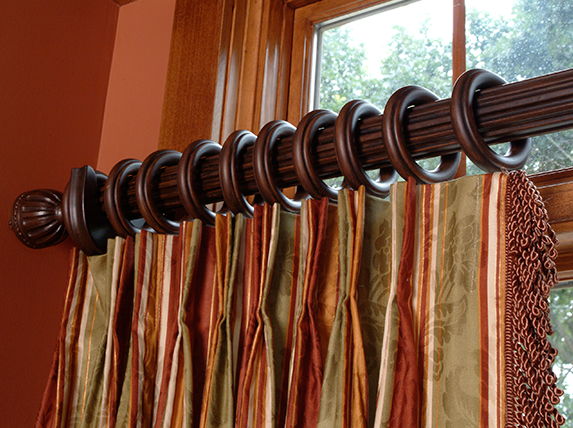 Before choosing the cut of your drapes, decide how much you want them to move along the rod. Deciding between stationary and traversing drapes makes a significant impact on the final cost of labor and yardage. Stationary styles means the drape won’t operate and is considered more of a decorative piece, while traversing drapes are able to open and close using a rod or hand baton—letting you control the light, privacy, or temperature with ease. Another choice to make is with the types of hangers you want. Some drapery pleat styles require curtain rings, which can be another way to show off your design prowess, while others adhere right to the rod for a more minimalist look. Once you’ve figured out your curtains’ practical needs, you can get to the style selection. The cut of a curtain can create the same nuance as the neckline of a dress so knowing your ripples from your rod pockets can prove to be pretty helpful. This video from the International Window Coverings Expo 2015, explains the different types of drapery pleat styles by our very own O’D McKewan and features some of our favorite design choices. Each pleat style can be presented with a variety of fabrics. Medium weight is the most common, as they’ll maintain the shape of the pleat throughout to the bottom, though lightweight fabrics offer a softer hang. The pleat styles can range from elegant to easy going, depending on your decorating demands. Choosing the style that’s right for you depends on the windows’ function and your own flair for the dramatic. If you’re looking to dress up the dining room, a Goblet Pleat paired with brushed metal hanger rings creates an elegant duo. If you’re trying to jazz up a window with a not-so-great view, a Traditional Tab Top paired with an ornate finial will keep things sleek and stylish. If you’d like to add even more depth, or simply allow more sunlight, sheer curtains are a great option. They keep things bright and breezy, even when paired with a heavier weight panel. Valances to cover the top portion of a window make a grand gesture when paired with sweeping drapery. A Cornice Box also serves as a statement-making topper. Their structured silhouettes allow for a little playtime in terms of custom details. You can wrap them in complementary fabrics—flowing latticework for easy style or a scrolling damask for royal flair—for a sophisticated accent to your drape design. This guide is a great starting point in your redecorating adventures. Please contact us for help finding the perfect drapery pleat and design styles for your home. Add a new burst of style and decorative inspiration to your home with new window coverings. The vast array of colors and fabrics set a luxe or laid back tone, while pleated details draw the eye upwards, adding height to the room. Happy pleating! I never knew so much went into deciding about purchasing drapes! This is great information, especially about how much fabric to get depending on how much they need to be moved.